For many people, it is enough to spend your holiday enjoying the beach, the hotel, walks. To some extent this makes sense when you are on holiday in Tunisia. I’m that kind type of tourism do not like and I consider it a waste of time. 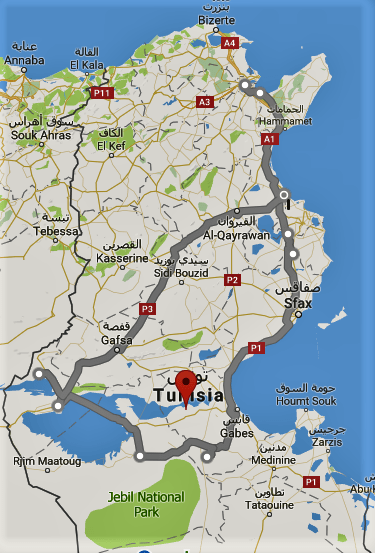 If you are from those who prefer active holidays, then you should be just a little bit of will and organization to the same time to tour the entire Tunis or in our case, the circuit of 1400 km. Do not believe me? We land at the capital’s airport Carthage and immediately embarking on a tour of the modern capital which, as the state, called Tunisia. About 20 percent of the population lives in it. The recommendation is visit the Bardo Museum, which has the largest collection of Roman mosaics. Medina in Tunisia is under UNESCO Protection from 1979. 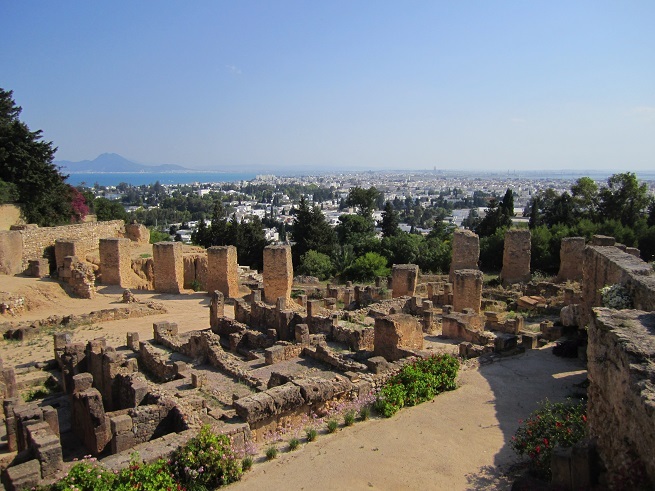 Not far from the town is the former capital of the Phoenician Carthage. The remains of the city on a hill, so the panorama that stretches in front of you, the white capital Tunisia and the sea on the horizon, magical. 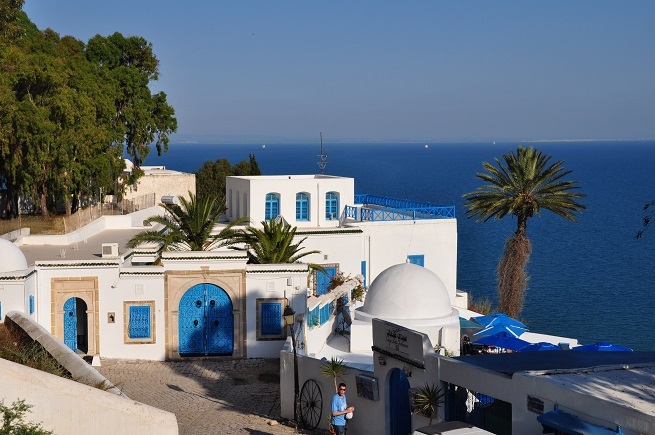 We continue our trip further to Sidi Bou Said , a town famous for its white houses and blue gates and windows, cozy restaurants and cafes, and along the main street lined with small shops. For the enjoyment of this lovely town, or swimming at the beach is worth a few hours. The road leads us to Hammamet. Dinner that followed, revealed to us the magic of the Tunisian cuisine: lots of salads and vegetables, rice, couscous, meat, fish, fruit and sweets dominated the spice of jasmine. Jasmine is a flower of the region, such as a lime tree with us. Hammamet has a wonderful old city center with medina from the Middle Ages, a lot of restaurants, cafes and shops. The beach is clean, pure and beautiful. Moving on to the south. Next stop El Jam. This is a strange place. The Romans made here amphitheater. Is somewhat smaller than the one in Rome, but it is better preserved. Quite an experience to look into all the underground corridors and enjoy the closeness to the distant history. An important historical monument is located in the nearby Keruan. 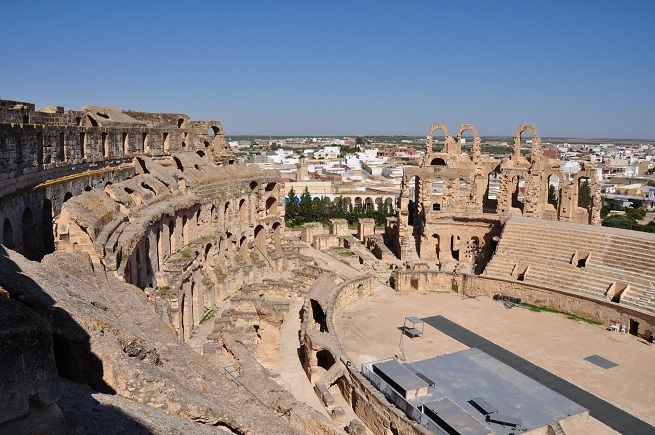 Today, this is a large city, it was the oldest Islamic settlement in Tunisia. 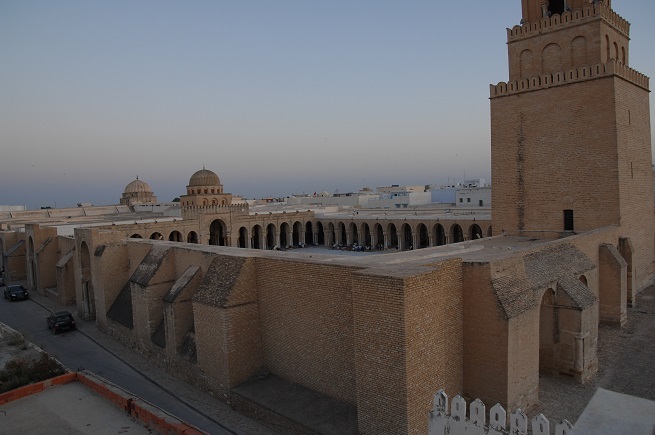 There is built and the oldest mosque in North Africa, Oqba Ibn Nafi, and its minaret is considered the oldest in the world. 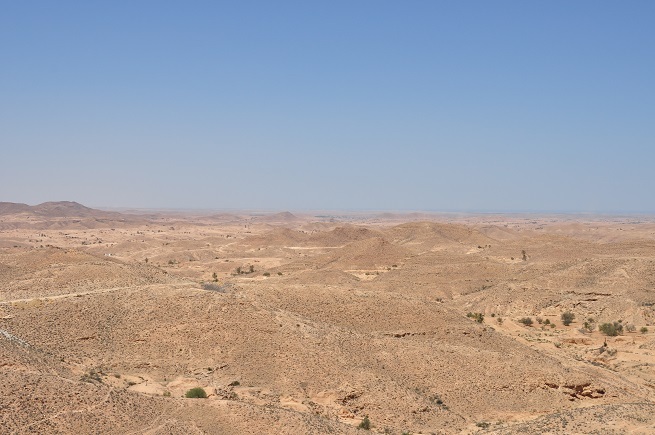 Just as our monks took refuge in remote areas, far from invaders, so Keruan is built 80 kilometers from the sea and 25 kilometers from the slopes of Small and the Saharan Atlas. Grand Mosque Keruan fourth character is a place of pilgrimage in the Arab world and if someone does not get to Mecca, Medina and Jerusalem, it is said that five trips to Keruan is worth a trip to Mecca. We continue to go south to the vast rocky desert hills Matmata. The landscape that resembles the moon’s surface. Four-fifths of the Sahara consists of rocks and stones, and only a small portion of the fine sand that says dine. 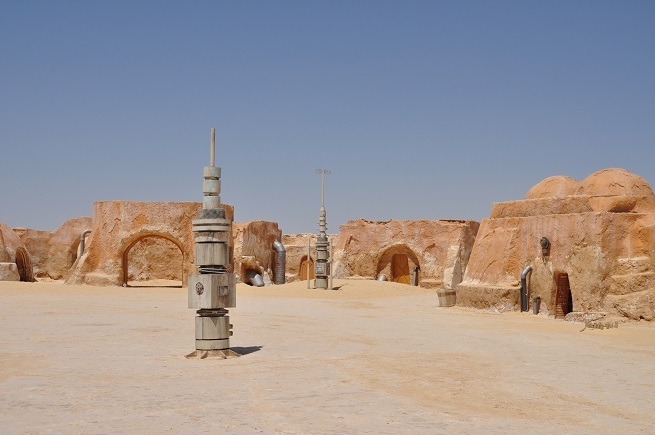 In the area around the town of Matmata sprang strange underground home of the nomadic Berbers of the nation. The sandstone rock they placed as many rooms as they were necessary for the family, and for all other hostile visitors became invisible. We visited an underground restaurant where we had lunch and strengthen the. 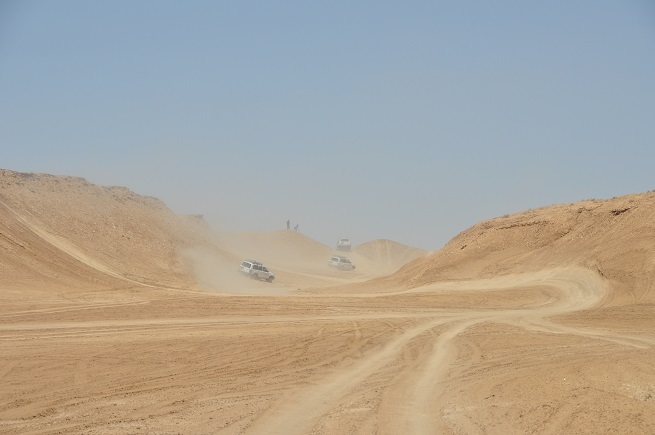 Next destination is Douz, an oasis around which spreads just the way we are all imagine a desert: the dunes, fine sand that stretches into infinity. 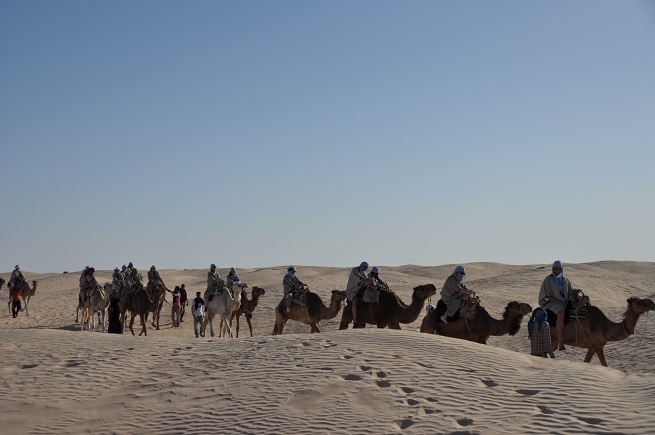 And there’s a big station for camels, which should be required to ride. The road then leads us to the west to the border with Algeria. 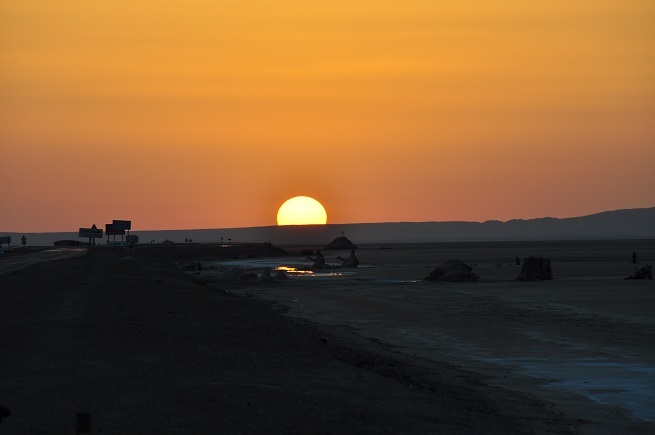 To get to the next town – an oasis called Tozeur, cross over the work not review salt lake Chott el Djerid. The road is straight as an arrow, we look wanders from the left to the right side, because all around us are salty ponds from which they are extracted, while the sun is on the horizon. We ourselves are on the road, the road also, and above it the sun sets. Around us unreal whiteness of the salt lake but also the heat from the warm wind that stirs as from a hair dryer. All in all, an amazing sight to behold. 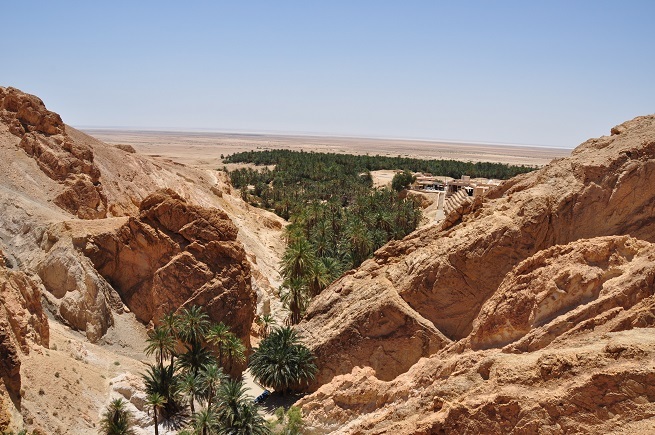 Tozeur is known for its huge plantations of dates. They are an important export product of the country. The warm evening, enjoying the pool and sweet dates. Divan end of a busy day. 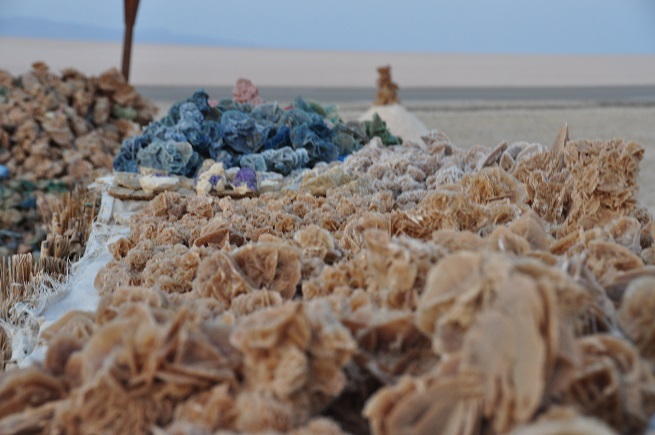 Desert roses are strange rocks that wind exercise of sand resemble a flower and a true souvenir of this very different place. The next place we visit the Tamaghza, oasis in the Atlas mountain range. There is a water source, river Cebik, which in part becomes a waterfall. For the most part we were climbing, which requires stamina, so when we finally find at the top, bathing under the waterfall was mandatory. We have been informed that in September in this part of the desert festival of electronic music, which features many international DJ. Partying outdoors, sleeping in a tent and bathing under a waterfall. Posted on the cart for the next period. Nearing the end of yet another magical journey. Last Station Sousse and Port el Kantaoui. 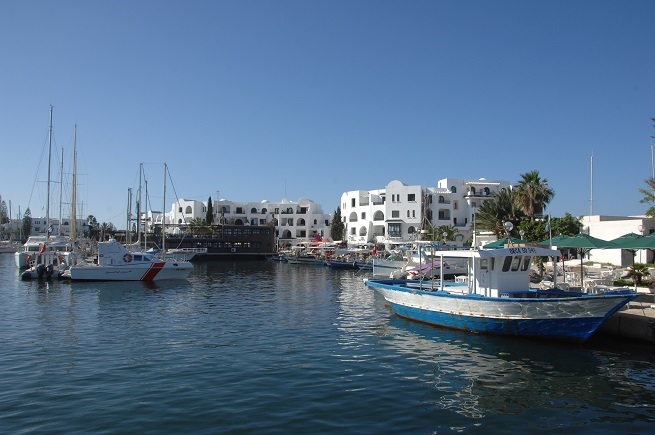 Port el Kantoui is a tourist destination that blends the ancient city drought. Clean, white tiled place with a great beach. Going to Tunis provides much more than a quiet vacation on the beach. Try, active vacations are something harder or will return home full of impressions and images that remain etched deep within you. Believe me, it’s worth!